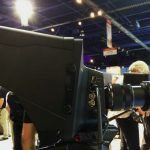 The second of two cameras revealed by Blackmagic at NAB (the first being the URSA), the Blackmagic Studio Camera is exactly what the name says: a studio camera. 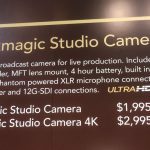 The Studio Camera comes in both HD and 4K versions, with the HD shipping now and the 4K shipping later this year. 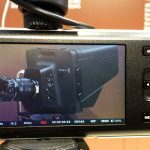 Blackmagic’s Bob Caniglia says that they refer to the Studio Camera as “the world’s smallest studio camera with the world’s largest viewfinder”, utilizing the same 1920×1080 screens found on the URSA camera. As Caniglia points out, the screen is a high resolution monitor which can be easily tilted and has a great viewing angle, making it viewable at all sorts of odd angles. The Studio Camera’s internal battery lasts for 4 hours, making it perfect for sporting events. Its audio inputs include XLR ports with phantom power. Each camera is also capable of remote talkback and tally. Caniglia explains this allows you to get talkback (with headset) and tally through fiber optic cable. Other ports include a 12 gig SDI in/out on the 4K version, and a 3 gig on the HD version. Finally the Studio Camera has a micro four-thirds mount, and shoots at 60 fps. 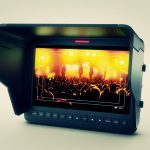 Compatibility with Blackmagic’s ATEM switchers is a big feature, allowing you to control the camera or ideally a series of cameras remotely using a fiber connection. You can control gain, iris, focus, and pretty much any other function from within the associated application. 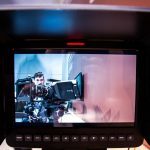 You can also create custom color grades in the camera using a DaVinci like method in the control software and apply them in camera . Finally, being strictly a studio camera, there is no onboard recording, with recording taking place on your recorder of choice. As for the sensors, the HD version posesses the same super-16 sensor as the Blackmagic Pocket Cinema Camera. The 4K version will boast a new sensor designed specifically for television. More details on this sensor to come closer to its ship date. Blackmagic Studio Camera will be demonstrated on the Blackmagic Design NAB 2014 booth at #SL219. Blackmagic Studio Camera is one of the most advanced broadcast cameras for live production because it includes features specifically targeted at the requirements of live production! 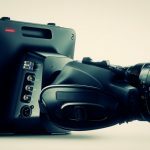 Currently customers often need to use cameras designed for general video production for live work and this means they don’t get features that live production demands, such as large viewfinder, talkback, tally, optical fiber and a super strong metal design. Inside the incredibly tough and lightweight magnesium alloy body, the Blackmagic Studio Camera features a very large 10” viewfinder, long duration 4 hour battery, talkback, tally indicators, phantom powered microphone connections and built in optical fiber and SDI connections that let you connect to a live production switcher with a single cable! 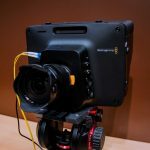 One of the problems of cameras used in live production is small viewfinders and the Blackmagic Studio Camera includes a massive 10 inch screen that allows incredible creativity when framing and accurately focussing. The viewfinder’s LCD is extremely bright and has a very wide viewing angle so it is perfect for use even in direct sunlight. The camera also includes a large fold up sun shield making it perfect for outdoor use and the sun shade also acts as a privacy shield when in use. The Blackmagic Studio Camera features an active Micro Four Thirds lens mount that is compatible with an incredibly wide range of lenses and adapters. This allows customers to use high quality photo lenses for smaller setups or fixed camera use, and then use high end broadcast ENG lenses for large live broadcasts using an MFT to B4 lens mount adapter. This means customers can start out with a more affordable setup based on photo lenses and then move to larger but more expensive ENG lenses as they grow their business. 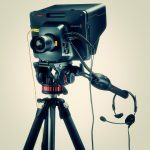 The Blackmagic Studio Camera includes a built in fiber optic connection, allowing customers to get the manyadvantages of long lengths and small size and weight of optical fiber for a single thin tether cable to connect cameras to your live production switchers. The optical fiber connection is bi-directional and carries HD or Ultra HD video with embedded audio, talkback, tally and even camera remote control. The built in talkback allows the camera operator and crew to communicate at all times during production using commonly available and very robust general aviation headsets for better quality talkback with better noise canceling at a much lower cost. • Features all standard connections, including dual XLR balanced mic/line audio in with switchable phantom power, headphone and microphone jack for talkback, LANC remote control and standard 4pin XLR broadcast standard DC 12V power connection.